It's Catholic Schools Week and I didn't want it to pass without pointing out some of the things I love about the Catholic school our children attend. If you are considering where to enroll your kiddos next year then I hope this list might help you see some of the perks of a Catholic education. Now, we have had a great experience with our local public school and we are very fortunate to live in such an amazing school district. We have also had some experience with and lots of exposure to homeschooling so we know how wonderful that can be. But this isn't a week for celebrating public schools or homeschools. 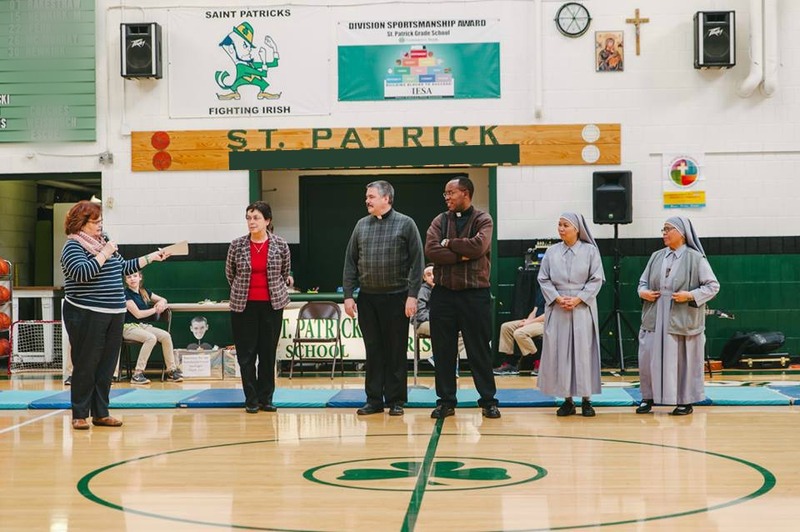 It's a week for celebrating the parish ministry that is brick-and-mortar Catholic schools. So let's get going! This isn't about building up a politically correct culture, this is about serving, loving, and reaching out to others. 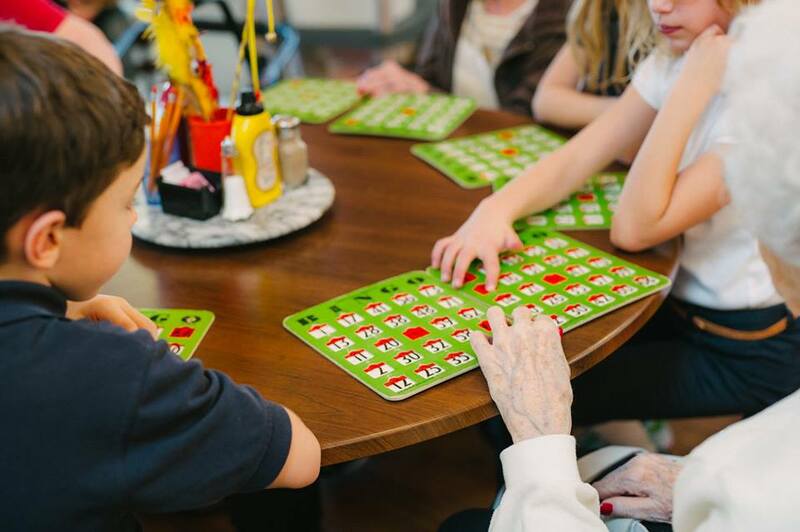 Students at our school regularly have service projects such as visiting the local nursing homes, making Thank You cards for our troops, and collecting donations for food banks and crisis pregnancy centers. Older students are partnered with younger ones to serve as prayer partners, helping them through Mass and being their general Big Buddy. And when I brought my kids with their severe food allergies to the school parents, faculty, staff, and students were all on board with keeping my boys safe and included. Once I popped in during lunch time and saw two of JF's classmates heading to the bathroom. "We have to wash our hands so JF doesn't have an allergic," they told me. I mean, how sweet is that? Our Catholic school is 100% orthodox and proudly Roman Catholic. Pre-K through 8th grade students attend Mass weekly and appropriate grades attend monthly confession. Each class, K-8, makes a weekly holy half hour before the Blessed Sacrament. They pray throughout the day in class, celebrate feast days, and talk about saints, morals, ethics, virtue, and faith. When my grandfather was dying my kids were able to go to school and tell their classmates what was happening and then their entire class prayed for my grandfather (as Ben told the story he added, "Even Sister!"). When Grandpa's funeral was held (he belonged to the same parish as us) we learned that every time there is a funeral a class is sent over to attend the Mass so they can pray for the dead. How amazingly beautiful is that? Pay no attention to the mural that literally and figuratively looks like Hell. One of my kids is dual-enrolled at the Catholic and public schools. At the public school when he is pulled out for extra help he is with four other kids, working at a table with one teacher. At the Catholic school he is in a class with 12 other kids and there is one other Kinder classroom. When he is pulled out for extra help he is by himself or with one other student and the teacher. At recess my first grader plays kickball with boys from his class and second and third grade. My kids, the oldest is in 3rd grade, know most of the other students at their school and they know who is siblings with who. That size means they are cared for and looked after by their fellow students and all the faculty and staff. When one child or team succeeds the whole school celebrates and when one child or family suffers the whole school rallies to support. There is definitely a wide variety of people involved at our parish but, for us, it has worked out that because of the way our family has benefited from the parish ministry that is the parochial school we have also been more inclined to partake in other parish events. 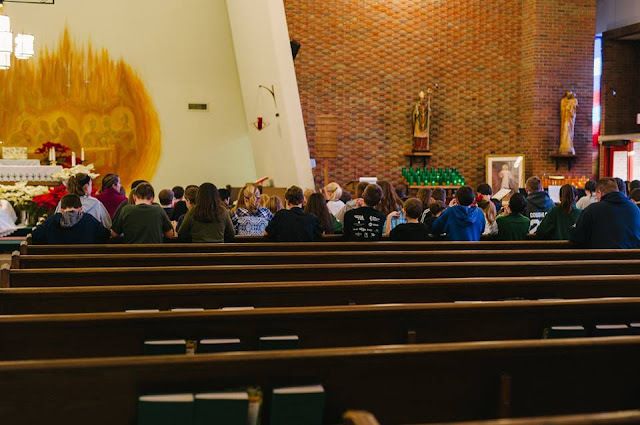 Our children are comfortable at our church and we all know they are welcome there so penance services, adoration, Holy Week Masses, parish retreats, speakers, and yardwork clean-up days - we attend these events without batting an eye. Doing so has broadened our connections and friends beyond the school pick-up line and our small groups. It feels good to give back to and be engaged with a parish that has given us so much. Yes, the building is old, but the technology is good and the teachers are excellent. Beginning in Kindergarten students are having experiences in public speaking by doing readings at the weekly All School Mass. The school has been recognized nationally for its excellence in academics and it's not uncommon for the local public and Catholic high schools to have the Valedictorian be from our elementary school. Along with the core classes, students have Religion, Spanish, Computer Class, and even Art. Sports, band, and choir are available. My children are learning, having fun, and surrounded by people who love Christ and His Church. It's literally the answer to our prayers. I know that we are incredibly fortunate to live in a town with good public and parochial schools. I would love to hear about the things that make your Catholic school great! And if you live in my area and you're interested in learning more about our school please feel free to contact me. Great list, Bonnie! This is our 2nd year at our parish school and it's been such a good experience all-around. We sent out Peter to Kindergarten at our parish school this year and couldn't be happier. I love it when I try to tell him about what saint day it is and he enthusiastically tells me an even more detailed story than what I was going to tell him. Plus one awesome bonus to Catholic school: uniforms! Getting dressed in the morning is a breeze because we already know what he is going to wear. We live too far away in the Maine woods from any Catholic schools, so homeschooling it will be for us when Kindergarten rolls around. But your post makes me wish we had a great, faithful Catholic school close by! Hi Bonnie! I found your blog after reading your Blessed Is She post this morning (loved it, btw). We have four kids, and our oldest began kindergarten at Catholic school this year. We're an Army family, so we move allllll the time, but we always hope to be able to enroll our children in Catholic schools wherever we happen to be stationed. We've had a wonderful experience so far! That sounds awesome! Our nearest Catholic school is over an hour away and too expensive. But I attended a Catholic school for two years (for the academics) when I was younger....I know that the seed was planted there for my conversion. I loved the Mass and religion class, even though I didn't know what the heck was going on!